Cast stone fireplace mantels are great because they can be made custom to go around most fireboxes. 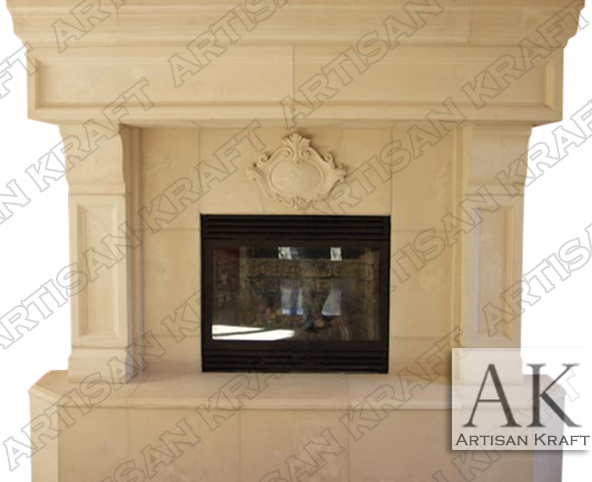 Artisan Kraft offers a high quality GFRC making feel and look like real limestone. This is a paneled style design. The legs have recessed panels as well as the mantel shelf. The medallion above the prefabricated is an additional charge. Seam lines give the precast it’s feature look. Stone: Travertine, cast stone, limestone, GFRC, sandstone, marble etc.